[It is] easy for us to provoke and bait this administration. All that we have to do is to send two mujahidin to the furthest point east to raise a piece of cloth on which is written al-Qaeda, in order to make the generals race there and cause America to suffer human, economic, and political losses … This is in addition to our having experience in using guerrilla warfare and the war of attrition to fight tyrannical superpowers, as we, alongside the mujahidin, bled Russia for 10 years, until it went bankrupt and was forced to withdraw in defeat. Over the next 10 years, America spent $360,000,000,000 on Federal homeland security expenditures and $2,600,000,000,000 on wars in Iraq and Afghanistan. 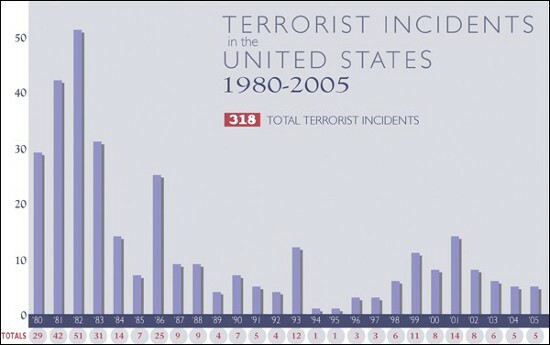 From 2002 to 2005, there were two deaths in America as the result of terrorism. 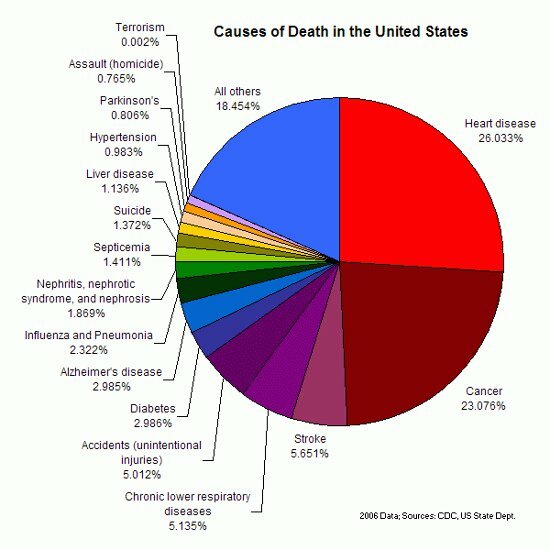 From 2002 to 2005, there were 171,994 deaths in America from Automobile accidents (see also here and here). In 2007, 616,067 people died of heart disease, 562,875 of cancer, 135,952 of stroke, 74,632 of Alzheimer’s, and 71,382 of Diabetes; there were a total of 1,796,013 health-related deaths. Federal spending on Defense and Homeland Security for 2009 was $737,000,000,000. Federal spending on Medicare & Medicaid for 2010 was $793,000,000,000. Americans spent $110 billion on fast food in 2000. There have been 6,026 American Military deaths in Iraq and Afghanistan. There have been over 100,000 Iraqi Civilian deaths as a result of conflict since the 2003 American Invasion. On May 2, 2011, Osama bin Laden was killed.